Twice this week I have wanted to stop the exercise I was doing. Two times mental strength has had to take over and persuade me to carry on. It’s not always the right thing to do and knowing when to listen to that voice in your head and when to turn it around can be tricky. Yesterday I ran the Belvoir Challenge marathon. It is an off road (trail) marathon which has a reputation for two reasons; mud and cake! It certainly provided both by the bucketload. The sun was shining on the frozen ground as we started and I felt good. It quickly became clear that some previous rubs from a different pair of trainers I had worn earlier that week were going to be a problem. At the first checkpoint (there were 4 checkpoints on the run, each providing cake, sandwiches, sweets and drinks) I stopped and quickly whacked on some blister plasters. The pain from my feet didn’t abate and jumping from a stile I felt an old hip injury jar. As my body started to falter my mind did too. Less than 8 miles into a 26 mile run and I was seriously questioning if I could finish. Three letters popped into my head; DNF. DNF are the dreaded letters no one wants after their name on race results. They stand for Did Not Finish. I have seen many a blog post lamenting the acquisition of these. Would these letters be mine today? Only I could decide. As I drew alongside another runner we struck up a conversation. We were passing beautiful Knipton Reservoir and I told him I had just been trying a mental break down the rest of the run into bite sized chunks. His reply ‘that’s exactly what I’ve just been doing’. Just what I needed to hear! I wasn’t alone. We gave each other words of encouragement and parted ways. Checkpoint 2 was at 12.2 miles, still less than halfway. Now my knee had joined in with the niggling pain. Iceland came into my head. If I carried on now I could make these injuries worse and really stuff up running across Iceland. I made a choice. Two co-codamol went down my throat, along with some flapjack. I pushed on form the checkpoint as quickly as I could, before my body seized up! As I crossed the next field I stumbled. The worst of my blisters (or so I presumed, I daren’t stop and look) sent out a shock of pain. I bit hard on my finger to distract me. The pain killers did not kick in quickly. When you are exercising like this you don’t digest very quickly. I was going to have to give myself a talking to. Firstly I reminded myself why I was there. I love running! This race was going to take about five hours and that meant five hours of head space. Time for me to think about everything and anything I wanted to. Space to consider my life; what is making me happy, what is not, where is life going next. I love that you can achieve all of this by going for a run. I was also surrounded by gorgeous countryside. The ground was so uneven and muddy that I sometimes found myself staring at my feet. Far nicer to slow down, lift your head and enjoy. I told myself that checkpoint 3 (17.2 miles) was my decision point. At any checkpoint you could quit and they would drive you back to the start. I didn’t want to finish in a car but I had to think of Iceland. Arriving at the checkpoint I felt a little better. The pain killers had started to take the edge off. Another mental breakdown; it’s 4 miles to the final checkpoint. I can run 4 miles. After that it’s 5 miles to the finish. I can run 5 miles. My mind totally banished the thought of the total being 9 miles. Despite eating at both checkpoints and snacking on a Luchodillito (a great alternative to energy gels) my stomach felt empty. That meant I was running low on energy. Soon I would start to feel cold. I struggle to eat much when running but forced myself to eat a little more at this checkpoint and I grabbed half a mars bar for nibbling on (well, inelegantly chewing while trying to breath through my mouth) while running. For me finishing is winning! I will never be the fastest in a field. That’s not to say I don’t set targets. I do like to finish well in the top half and for this race I set myself a target time of five hours. I don’t have a running watch at the moment. For the entire race the only time I knew what distance I was at was when I got to a checkpoint. I never looked at the time. The final checkpoint came into view far sooner than I expected and I felt tears of relief prick at my eyes. ‘Too soon to cry Cadi, you can’t breathe if you get emotional!’ One final food stuff and I set off for those final few miles. Running along one of my favourite paths, on a ridge in the woods near Belvoir Castle, I took in the views and smiled. Passing another runner we smiled with relief ‘we’ve got this now’ I told him ‘Yeah, we do!’ he replied. We had now re-joined the route of the 15 mile race and were overtaking the walkers. Their words of encouragement as I passed meant a lot. And I made it. I finished. And I enjoyed it, I think! 4 hours, 59 minutes, 57 seconds = one happy Cadi. But should I have stopped? I have been lucky. The blisters are bad and my muscles ache but my hip and knee seem fine. I took a risk and it paid off. If they had deteriorated I know I would have stopped but by masking the pain with painkillers I could have done myself damage. The reason I didn’t stop was I felt fit. Something in my body was telling me I could do this. On another day I may have got a different message and it is important to know when to stop. Some days our bodies are tired and carrying on is just detrimental. It would have actually taken more mental strength for me to stop. I will hold that with me. Nice one Cadi. I hope you’ve cleaned those running shoes. 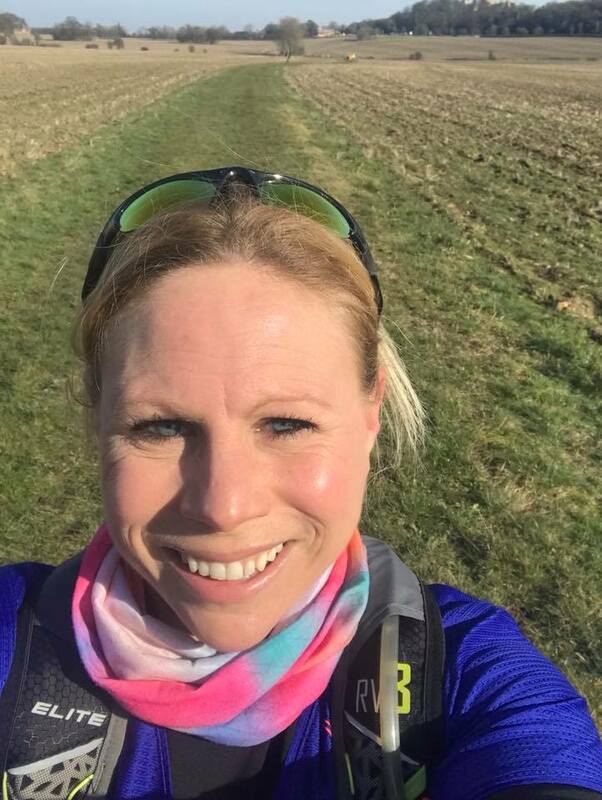 Hi Cadi, great that you managed to complete the marathon – that’s a fine achievement! I once finished a Marathon in 3.5 minutes. And it was rock hard as it had been in the fridge for at least two days. Get the jetwash on them. But you’ll need someone to help. If you just try jetwashing them on the floor, they will just shoot off all over the place. Get your best friend to wear them while you jet them. Just tell them “you’ll be fine, trust me”.